One of Morocco’s former imperial cities, Marrakesh lies north of the foothills of the snow-capped Atlas Mountains. The city is a blend of culture, religion and trading centres in busy squares. 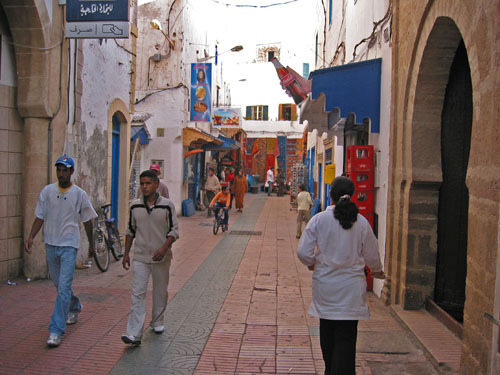 The central medina contains many narrow, maze-like streets and provided us with hours of entertainment – that is if you call getting lost and walking aimlessly for hours on end entertainment. But alas, in hindsight, that was part of the charm of Marrakesh. Marrakesh truly rules, but it was time to move on to even better times if my son’s advice was to be followed. It was an early morning start as we arrived at the bus station. We didn’t have to wait too long, which didn’t matter because it’s always fun to people watch, especially in a country with a totally different culture; and what better place than a bus station. We were actually the only ones there but managed to enjoy ourselves trying to keep track of how many cats occupied the seats in the waiting area. When you have to get from point A to B when you’re travelling, or even when you’re at home, you have several options, some of those being trains, planes and automobiles and sadly, buses. There’s just something about riding a bus that makes me wonder what I did wrong. What have I done that I should be punished in this fashion? Its affordability bestows a certain degraded level of just about everything on the brave souls who choose this mode of transportation. The bus ride from Marrakesh to Essaouira was about two and a half hours. The scenery was not that interesting, very typically North African, open fields, very few trees and very little vegetation in general, a lot of dirt and dust. I was still recovering from a somewhat severe stomach ailment suffered in the desert but I didn’t feel too bad on the bus trip. Essaouira lies about 175 kilometres west of Marrakesh and basks on the Atlantic coast of Morocco. The present version of the city was built during the 18th century. The city walls, fishing harbor and squawking seagulls are all iconic in my mind. The narrow alleys, souks and an ever-present breeze provide atmosphere and the smell of fish guts and damp sea air is thankfully tainted with the aromas of spices and wood. 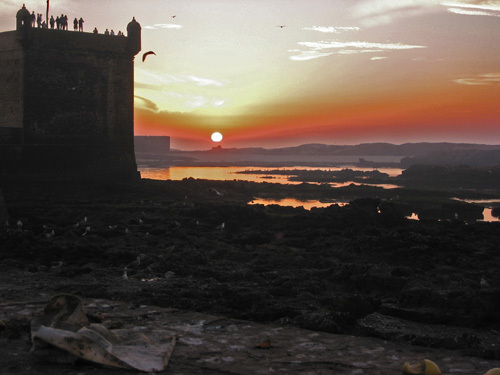 This same breeze renders you with a sand blasting at times – just one of the intriguing idiosyncrasies of Essaouira. It is really a shame that we were only there overnight. That certainly did not come close to doing it justice as it is the kind of place that takes time to adjust to and get a full sense of its beauty. Blue doors, windows and dories stand out in the tranquil landscape. Someone said the colour was displayed to ward off evil spirits, others that it has ancient religious significance, maybe it’s just what sets Essaouira apart from the pinks and pastels of Marrakesh. We arrived at the bus station and immediately tried to find out when the bus to Casablanca left tomorrow. The station was closed until 3PM so we would have to come back in a couple of hours. So, once again, find the riad. It’s a new Arabic game. We were approached by someone offering us a chariot. Of course, my immediate reaction was to tell him to go to hell, but fortunately Karen’s cool head prevailed. A chariot is not something you ride in, but a trailer used to transport your luggage. The bonus is the fellow dragging said chariot will find the riad. His incentive is he has to lug this miniature trailer full of luggage around, so he probably is not lying when he says he knows where it is. The walk to the riad was fabulous. 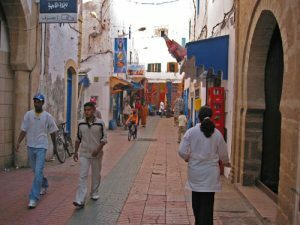 Once again, travelling through the numerous souks, down the narrow alleyways of Morocco, this is truly an awesome country and I can see us returning some day. 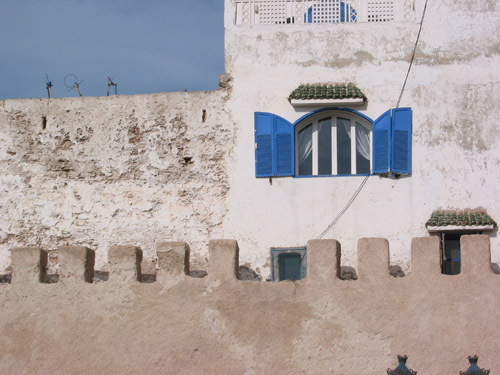 Our chariot guide found the riad with no trouble at all and we settled into another beautiful accommodation. The Riad Mimouna is more of a hotel than the previous ones we had visited in other areas of Morocco. 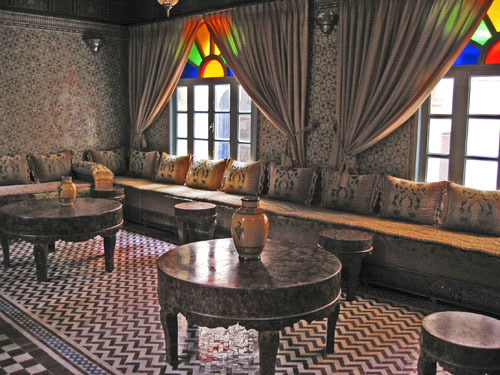 Multi floors and numerous rooms, it still had that North African charm. Just after 3 we headed back to the bus station because we had to book our passage to Casablanca for the next day. After lining up for nearly a half hour (Karen lined up, I went out and took some photos), we found that this bus line, which is as close to a luxury line as there is in Morocco, does not even go to Casablanca. So it’s off and running, well walking, to the “other” bus station. It was a few notches down from luxury, kind of a city bus feeling, and the trip to Casablanca takes 6 hours. No way!! I’m not sitting on a stinking bus for 6 hours, so off we go. We had taken a cab to the station but realized it wasn’t too far so we walked back to the city centre. It finally dawned on me that if I didn’t take the 6 hour bus ride, I wouldn’t be getting to Casablanca there being no railway or flight options. This revelation struck me after a walk down by the beach. I had begun feeling badly again, probably due to the walking and the worrying. After a brief nap on the seawall we headed back to the bus station to book the bus trip for tomorrow. 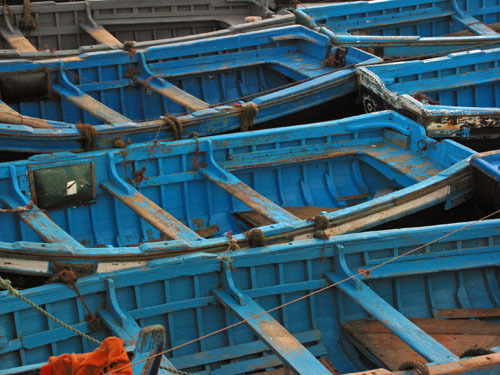 Essaouira is a scaled down version of Marrakesh but still holds a certain charm that seems to exist only in Morocco. According to many the harbour is the place to be. Judging by the activity, they were not wrong. It is a mixture of strange people both local and tourist. It is the perfect place to sit on the seawall, enjoy a picnic and marvel as the world passes by. Reminiscent of Key West, everyone gathers to enjoy the sunset. The area is inundated with seagulls and stinks to high heaven, but somehow that did not spoil the event. 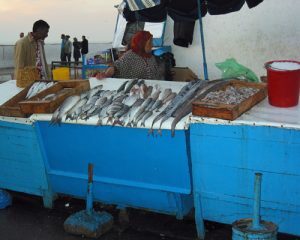 The fish market with all the local catches of the day is there for all to enjoy, smell and all. Tomorrow’s going to be a tough day. The bus leaves at 7AM which means up at 5AM. A 6 hour bus trip, oh boy, I feel a barf coming on. More by this author on his website and blog.